"I've got sheep to wrangle. No time - or need - for a hair cut!" The border collie is a working man's dog, and can sport two different coat types to keep him comfortable in all kinds of weather. The smooth coat is short and sleek, while the rough is longer and coarser. Grooming is low-maintenance, and both coats require only minimal trimming. Because your border collie is a working breed, his coat has evolved so that he doesn't need to spend long hours at the salon to keep it looking neat, yet still practical. Although you can theoretically trim your pooch's hair however you desire, the show standard for both types of the border collie's coat requires only a small amount of trimming to neaten him up. The longer hair on his feet is trimmed down, as is the hair on the back of his legs. The pasterns, or tufts around his wrists, need tidied up as well to conform to the acceptable show coat standard. That's it. 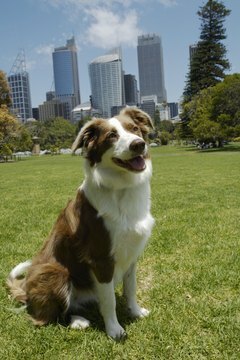 The sleek appearance of the smooth-coated border collie makes him look like greased lightning tearing around your yard. Because of the already short length of his coat, giving him an overall trim is unnecessary. The hair on his front legs, haunches and underside is longer and more feathery, and can theoretically be trimmed if desired to prevent tangling and mats. This is against show standard requirements, so if your border makes the rounds of dog shows, this will be frowned upon. Brush him once or twice a week to remove loose, dead hair, and bathe him once every three months or so. As the name suggests, the border collie's rough coat is coarser in texture than his smooth-coated cousin, and longer all over. Although longer, this poofier coat only requires the same basic show-required trimming around the feet, pasterns and hocks. Any trimming outside of these areas is penalized in the show ring. If your pooch is purely pet, you can theoretically have his hair trimmed shorter to neaten him up, but this type of trimming isn't necessary. Because of the length, you'll need to brush him three times a week to keep him from matting and to remove dead hair. Bathe him once every three months or whenever he finds a mud puddle to play in. Because border collies carry thick double coats, you may think a shave down in the summer will help keep him cooler. Don't worry, Mother Nature has him covered. Borders shed lightly year-round, but have heavier shedding times twice a year as they grow, then lose a thicker winter coat. His double-layered coat actually helps to protect him from all elements, and acts as insulation to keep him cool in summer and warm in the winter. Besides, shaving a double-coated dog like your border may alter the way his coat regrows, causing it to come in looking patchy and pitiful. Do Corgis Need to Get Haircuts?